Google DNS benchmarked. And it's s l o w .
It’s official, Google has taken over the internet. If you missed the news, or just don’t care, Google announced the launch of their new DNS service. In their own words, you could think of DNS as “the switchboard of the Internet”. The move to offer this new service is a vertically integrated move for Google to control yet more bits of your overall interneting experience. Highlighted are the Google servers. Not too impressive, huh? Contributing factors to this data are my admittedly crappy Qwest DSL connection, and location. 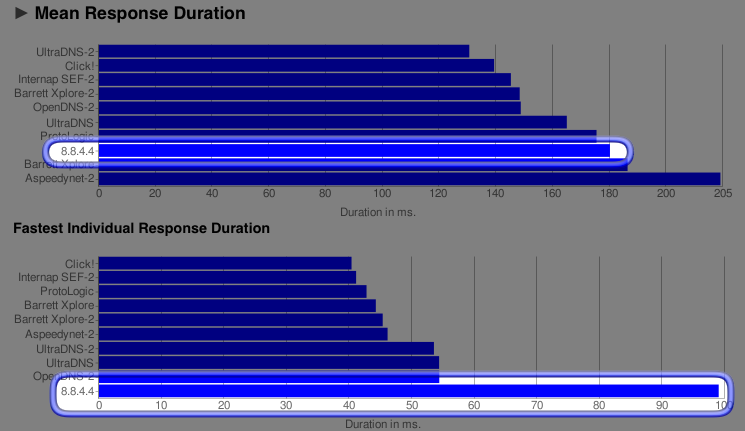 But even so, it looks like the service is not running at top speed just yet, so hold off on switching your nameservers. Perhaps with time the server response will improve? The above screenshot shows test details for the Google DNS servers. Of note from this data are the “shares cache with” lines in the right column. These are DNS servers that have essentially been subsumed by the Google’s new DNS servers. Dwarfed, overshadowed, gobbled up. You can also perform a traceroute using the Network Utility app included in OS X (it’s in Applications/Utilities). 1 comment to Google DNS benchmarked. And it’s s l o w .
Thanks, Joel. Somebody's gotta try to keep them honest. Hope all is well. Happy Holidays.